The information you request in the Get Notified form will be customized to meet your specific needs. You can sort the report by Product, SKU, Number of Interested Customers or Quantity Available for Sale. Find out who is interested in purchasing an item that is currently out of stock so you can better plan order replenishment. When an product or plant has zero items available for sale, a "Get Notified" link will be displayed with the corresponding record on both the index page (summary listing of products or plants) and on the product or plant detail page. This functionality allows you to see what the demand is for a product you are not carrying or is out of stock. In your Clarity Console back office, you will be able to see the Items in Demand Report to see how many people have requested notification. You can sort the report by Product, SKU, Number of Interested Customers or Quantity Available for Sale. 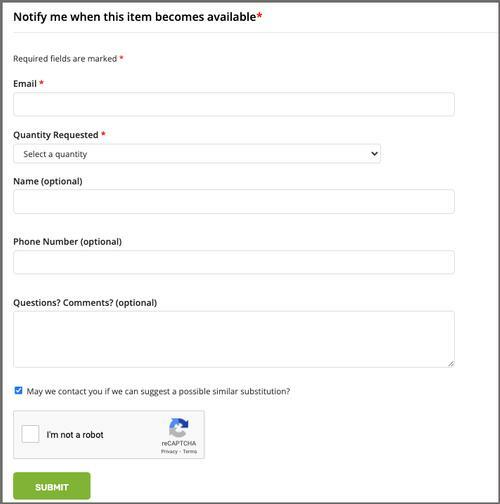 When you have updated your inventory, you can click on Notify Customers of Items Back In Stock to send emails to all customers to notify them that the plant or product SKU they were interested in is back in stock and available for purchase. 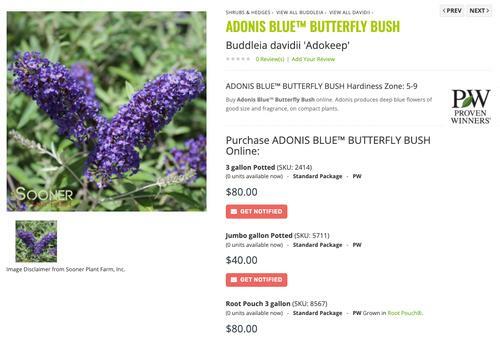 You may have to select various plant categories to find a plant that is out of stock so the 'Get Notified' button shows.